“Hidden Figures” (2016). Cast: Taraji P. Henson, Octavia Spencer, Janelle Monáe, Kevin Costner, Kirsten Dunst, Jim Parsons, Mahershala Ali, Aldis Hodge, Glenn Powell, Olek Krupa, Ken Strunk, Kurt Krause, Donna Biscoe, Corey Parker. Director: Theodore Melfi. Screenplay: Allison Schroeder and Theodore Melfi. Book: Margot Lee Shatterly, Hidden Figures. Web site. Trailer. As the space race began heating up in the late 1950s and early 1960s, the American effort needed the best and the brightest minds it could find to keep pace with an aggressive Soviet program that chalked up a string of impressive accomplishments. NASA recruited anyone who possessed the talents required to fulfill its needs, including those who were otherwise marginalized by mainstream society, such as women and minorities. That attitude afforded tremendous opportunities to those who might otherwise be left on the economic and professional sidelines, even if some of the challenges and prejudices they faced in the outside world reared their ugly heads inside the ranks of the space agency as well. But, for three gifted African-American women working at NASA’s Langley Research Center in Virginia, those obstacles were not enough to keep them down – or from realizing their dreams. 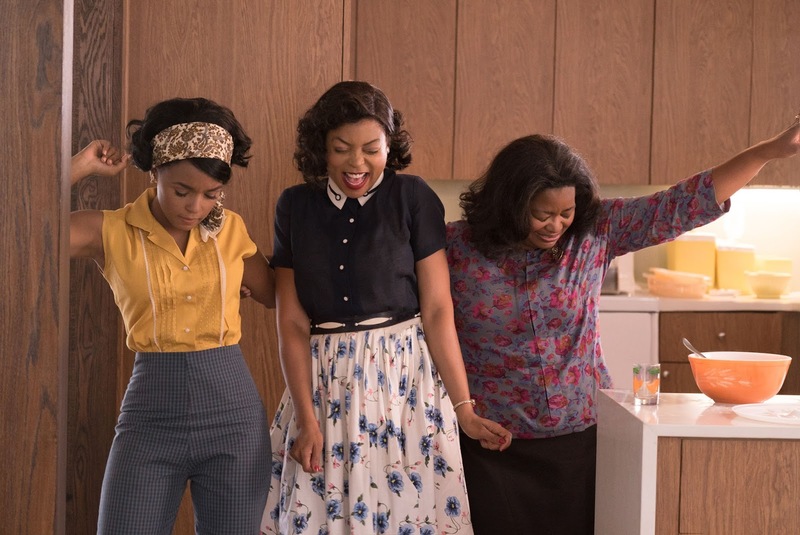 NASA employees Mary Jackson (Janelle Monáe, left), Katherine Goble (Taraji P. Henson, center) and Dorothy Vaughan (Octavia Spencer, right) make great strides for the career prospects of African-American women in the U.S. space program in the entertaining new biopic, “Hidden Figures.” Photo by Hopper Stone, courtesy © Twentieth Century Fox Film Corporation. Working with complex mathematical equations came naturally to Katherine Goble (Taraji P. Henson), a skill invaluable to an agency dependent on numerical precision (especially without the benefit of computers). As part of a team of human “calculators,” Katherine stood out, her abilities eventually landing her a position on the team charged with planning the launch and re-entry trajectories for NASA’s Mercury program. Although thrilled for the opportunity, Katherine quickly came to face the same kinds of discrimination inside her all-white, all-male workplace that she faced in segregationist Virginia society at large. In the view of close-minded co-workers like Paul Stafford (Jim Parsons), the Mercury program team was no place for a woman, let alone one of African-American background. So, to fit in (and to keep her job), Katherine put up with those conditions at first. This meant tolerating such institutionalized indignities as having to walk a half mile to a different building to use the only “coloreds” restroom available nearby, a severe inconvenience and a serious hindrance to her productivity. But such impediments didn’t keep Katherine from doing her job. And so, when it became apparent that her colleagues couldn’t get by without her, she began flexing her muscles, an action not lost on her boss, Al Harrison (Kevin Costner). Al saw what she was up against and unreservedly came to her defense, immediately leveling the playing field for her, regardless of how his other team members felt. While Katherine was busy laying the foundation for the success of the Mercury program, colleagues from her calculator group were looking for their own springboards to success. For Dorothy Vaughan (Octavia Spencer), the group’s de facto though unofficial supervisor, that opportunity came when she began looking into the technology that was threatening to put her and her peers out of work – a state-of-the-art IBM mainframe computer capable of performing thousands of calculations per second. Aware of the job security implications associated with this new technology, Dorothy began studying how it worked, an investigation that gave her a novel idea: Even though the computer could perform calculations far faster than its human counterparts, it would need trained programmers to make it operate. And, given that trained programmers were a rarity at the time, even among the ranks of IBM’s employees, Dorothy made it a point to learn how to run the device and, in turn, how to train her colleagues. This enabled NASA to make use of its new toy while preserving the jobs of her group members. It also earned Dorothy the official title of supervisor, along with the pay and perks accompanying it. Meanwhile, another calculator group member, Mary Jackson (Janelle Monáe), followed a different course. Her knack for all things engineering landed her a spot on the team conducting performance testing on the Mercury capsules. Her aptitude for the work caught the attention of Karl Zielinski (Olek Krupa), one of the team’s engineers, who encouraged Mary to pursue becoming a full-fledged engineer in her own right. Given her collegiate background, and with Karl’s support, Mary applied to become a NASA engineer, a dream that was very nearly quashed when her icy, by-the-book supervisor, Vivian Mitchell (Kirsten Dunst), informed her that she didn’t meet the qualifications. To come into compliance, Mary would have to complete several extension courses. There was just one problem with that: The classes were only taught at one local high school – and an all-white one at that. Mary wouldn’t be allowed to become an engineer without the required courses, yet she wouldn’t be allowed to take the classes where they were taught because she was black. Needless to say, Mary wouldn’t hear of that, taking matters into her own hands – and to court. 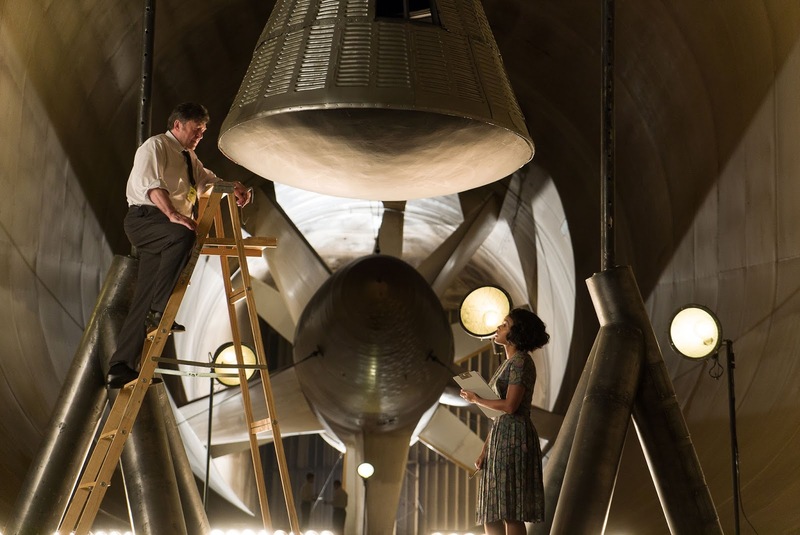 Aspiring NASA engineer Mary Jackson (Janelle Monáe, right) receives encouragement for her goal from colleague Karl Zielinski (Olek Krupa, left) in director Theodore Melfi’s “Hidden Figures.” Photo by Hopper Stone, courtesy © Twentieth Century Fox Film Corporation. The contributions Katherine, Dorothy and Mary made to NASA were considerable, yet their efforts, until now, have largely gone unrecognized. And they were by no means the only women, the only African-Americans nor the only African-American women who aided the U.S. space program, both in the race to the moon and thereafter. That’s where this movie comes in, celebrating the lives and careers of those long “hidden figures” who made so much possible. Of course, those remarkable contributors accomplished their goals because they believed they could, the hallmark principle of the conscious creation process, the means by which we manifest the reality we experience through the power of our thoughts, beliefs and intents. Despite the prevailing conventional wisdom and the considerable roadblocks that popped up in their paths, individuals like Katherine, Dorothy and Mary would not be deterred. They were so passionate about their beliefs and had such tremendous faith in themselves that they knew they would be able to succeed with their plans. Their resolute confidence and their sure-footed sense of themselves serve as a shining example to anyone seeking to fulfill grand aspirations. From a conscious creation standpoint, individuals like the trio profiled here are able to accomplish their goals thanks to several key principles. For starters, they’re adept at envisioning desired outcomes, picturing themselves ensconced in the results they seek to achieve before they ever get there. Katherine sees herself as a full-fledged, contributing member of the Mercury program team; Dorothy sees herself as a supervisor for her computing group, leading and training a dedicated group of workers; and Mary sees herself as a NASA engineer, making contributions and playing a part in her craft just as significant as that of her white male counterparts. Second, Katherine, Dorothy and Mary are aware of the limitations blocking their paths and are not intimidated by them. They forge ahead fearlessly, approaching their quests with personal courage and heroism, as well as mindsets bent on developing solutions that effectively get them around those obstacles. 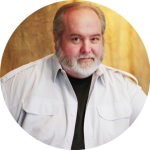 That takes the development of beliefs that run counter to what’s considered common knowledge – and then not being afraid to act on them. This may not be the easiest course to follow, and setbacks may appear along the way. But such circumstances often work wonders in helping us refine our beliefs (as well as the solutions that result from them) and in reinforcing our determination for success. If the three heroines of this film had allowed themselves to be done in by existing conditions, they wouldn’t have had a story to tell – or an opportunity to see their dreams come true. 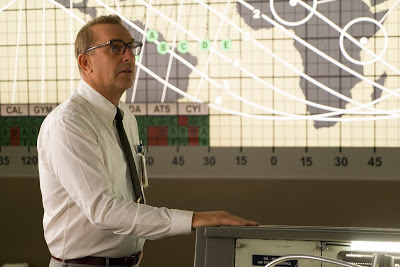 Mercury program administrator Al Harrison (Kevin Costner) seeks to level the playing field for women and minorities in the engaging new biopic, “Hidden Figures.” Photo by Hopper Stone, courtesy © Twentieth Century Fox Film Corporation. But, perhaps most importantly, they saw their career paths as expressions of value fulfillment, the conscious creation concept associated with being our best, truest selves for our own benefit and that of those around us. In some ways, this can also be seen as living out one’s destiny, becoming the individuals we were meant to be. Katherine, Dorothy and Mary certainly did that, opening doors for themselves and for those who would follow in their footsteps. That’s quite a legacy, both for them personally and for posterity, an accomplishment whose impact has carried over to this day. And that impact was reflected in so many ways, from the job opportunities they helped make possible for future generations to the many noteworthy achievements of the American space program. That’s quite a feat for those who were once relegated to sitting in the back of the bus. 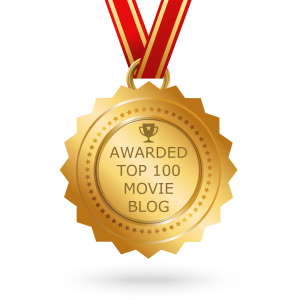 This delightfully inspiring comedy-drama is a flat-out winner, an incredible crowd-pleaser that fires on virtually every cylinder. Its inspiring narrative comes across like a curious fusion of “The Right Stuff” (1983) and “The Help” (2011), films that celebrate personal heroism in their own unique ways. With the possible exception of the need for a better-developed back story, this thoughtful and humorous historical drama hits all the right notes and does so without going over the top, becoming excessively preachy or lapsing into heavy-duty schmaltz. The picture’s incisive script and superb ensemble cast performances make this one to see for audiences of all ages. 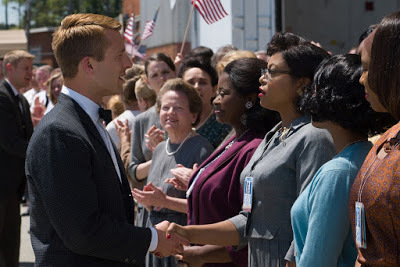 NASA employees Katherine Goble (Taraji P. Henson, third from right) and Dorothy Vaughan (Octavia Spencer, center) do their part to advance the U.S. space program for Mercury astronauts like John Glenn (Glenn Powell, left) in “Hidden Figures.” Photo by Hopper Stone, courtesy © Twentieth Century Fox Film Corporation. 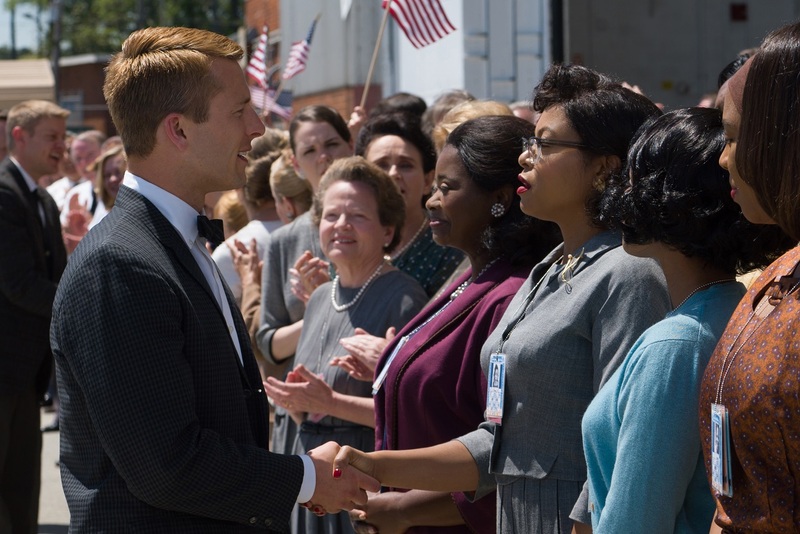 For its efforts, “Hidden Figures” has garnered considerable awards season recognition. The film won the National Board of Review award for best ensemble and was named one of the organization’s top 10 films of 2016. In addition, the picture earned three Critics Choice Award nominations, including best ensemble, best supporting actress (Monáe) and best adapted screenplay; two Golden Globe Award nominations for best supporting actress (Spencer) and best original score; and two Screen Actors Guild Award nods for best ensemble and best supporting actress (Spencer). It’s a strong contender to pick up Academy Award nominations as well. One of the things that keeps us going as human beings is our desire to rise to our own greatness. It’s an aspiration that can appear quite daunting, perhaps even impossible, but those circumstances often don’t stop us from pursuing that Quixotic quest.  Like the mythical Sisyphus, we insist on continually rolling that giant boulder to the top of the hill, no matter how many times it may fall back down, all in the hope that our efforts will pay off – because, one of these times, they just might. That’s the sort of determination Katherine, Dorothy and Mary employed in their respective undertakings, and just look at what it got them. We should all be so motivated. And, if we were to be, we’d then know the joy, satisfaction and fulfillment that comes with us reaching for the stars – and getting there.